Everyone’s heard about the latte factor, or about how much money you can save by quitting smoking. Our daily vices can quickly become a financial burden if we don’t keep them in check. But what about the more subtle habits that are a constant drain on our finances? Years ago, before my wife and I got married, we lived down the street from a Tim Horton’s. Shocking, I know…considering there’s only one Tim Horton’s for every 8,000 people in my city. Every weekend we would walk over to Tim’s for breakfast; which consisted of a large coffee and two everything bagel’s with cream cheese for me, and a large coffee, muffin and yogourt for my wife. Total cost – $10. Sometimes we ate there on Saturday and Sunday. This was our equivalent to the pack of cigarettes a week habit. I’m not sure what we did to finally break this habit, but now we eat breakfast at home for about $2 a day, including coffee. And guess what? The bagel and coffee are just as tasty at home. Something as simple as changing our breakfast habits has saved us over $500 a year. The point is that I used to think it was impossible to save more money or cut back on our expenses, but when I took a closer look at our daily routines and habits, I was able to find big savings just by making small changes in our routine. We’ve all come home from a busy day at work without giving a second thought to our dinner plans. So what do we do? Stop for take-out on the way home from work, or head out to a restaurant for a quick meal. Taking a few minutes to create a weekly meal plan helped us break that habit and saved us hundreds of dollars a month. 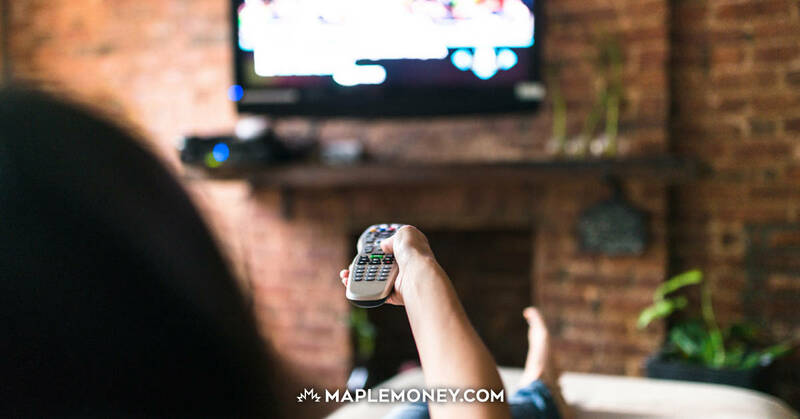 Most of us find the budgeting process tedious and believe that as long as we pay ourselves first we can do whatever we want with the rest of our paycheque. The problem with this approach is that you’re more likely to squander money on little things that you don’t even realize have become a habit. Tracking your expenses for a few months will give you a good sense of your spending habits and then you can develop a budget to keep your expenses in-line. Canadians love debit cards, even if we have to pay up to $12.95 a month for the privilege of using them. After I got my finances under control, out of habit, I still used a debit card for my everyday spending. Then I discovered rewards credit cards, which worked just like my debit card except I was the one getting paid in the form of cash back or Air Miles rewards. Just make sure to pay off your bill in full every month and don’t overspend just to earn more points. I’ve earned more than $500 a year just by using my rewards credit card regularly. We all have our vices, and I’m not saying we need to eliminate the things we enjoy. But it’s important to understand the difference between healthy routines and bad financial habits. Small changes in your habits can save you hundreds, if not thousands of dollars a year. @krantcents – I’m amazed at the number of people I work with who don’t bring their lunch or coffee from home. Buy an electric percolator. The coffee’s as good as Tim’s, without the trip or the cost. Or the lineups :). Great Post! I’ve just started a series on “This Is Why We’re Broke” at DollarMusings talking about the same thing… small changes that can make big differences. I think people need to think about long-term planning (as part of their budget). Very small changes today can add up to HUGE changes in retirement amounts tomorrow. @Edu – Thanks! Some people think it’s a waste of time to budget or track expenses, but you’d be surprised how much money you can save with a few changes in your daily routines. Great post. I think we need to learn to give up more things. The negative turn in the economy has helped people to save more and spend less on unnecessary items, but we still have areas to improve. With that said, I liked your point about we still don’t have to give up things we enjoy. Meal planning can save a very bid amount of money, especially if you spend a lot of time running around and find yourself grabbing fat food – oops, I mean “fast food” – all the time. Bringing snacks and portable meals along the way can save a big amount over the course of a year.